The idea that abortion is a woman’s right was always just an opinion. There’s no basis in law, in logic or in our constitution. And there’s certainly no basis in early feminist thought. 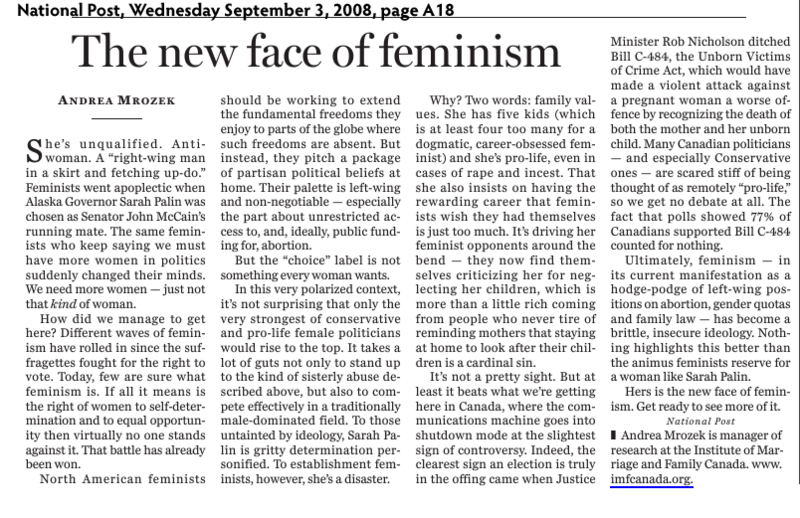 Now, on the 20th anniversary of the Morgentaler decision, it’s time for a new idea to take hold. Introducing ProWomanProLife, a pro-life site by women and for women in Canada. The founding board are women from different walks of life (medicine, psychology, actuarial science, journalism, and public policy), different religions (or no religion at all), have never been vocal or activist on abortion before, do not represent any larger group, and do not currently receive funding from any larger group. ProWomanProLife is a home for all women who believe that being pro-life is compatible with women’s rights and freedoms. ProWomanProLife celebrates women’s legitimate choices, freedoms and rights. ProWomanProLife believes abortion is bad for women and that women will be integral in removing abortion from our cultural landscape. ProWomanProLife desires to bring an end to abortion, not by coercion, but by choice. ProWomanProLife believes abortion is a human, social issue, not a religious or faith matter, whereby women and men of any faith or no faith at all can stand up in support of women’s rights and life, at the same time. ProWomanProLife understands the fetus is a new and unique human being from conception, separate from, though dependent on, the woman. ProWomanProLife believes that the fetus is deserving of protection. ProWomanProLife believes that a compassionate community can and should offer alternatives to abortion. We believe that these alternatives are a key part of eliminating abortion in Canada. ProWomanProLife stands up for freedom of speech. ProWomanProLife believes abortion is an issue we must face together as a society.